I'm always looking for age-appropriate learning tools for my twins as they continue to discover and grow. 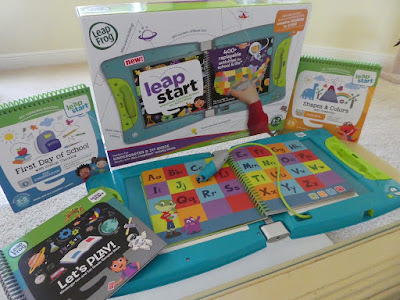 As a LeapFrog Mom Squad member, we recently tested out their latest learning solution, the new LeapStart ($39.95), an all-in-one interactive early learning system for Preschool through 1st grade, jam-packed with key school and life skills for curious 2-7-year-olds. The LeapStart works with a library of replayable activity books (not games) that are sold separately for $12.99 each. The device comes with a sampler book though to get you started. Each book focuses on different skills from reading and writing to math, coding and STEM and more. Every book has the proper age range recommendation listed, which is super helpful. Once a parent registers the device, you then need to download the compatible audio for the activity book, but it's pretty easy to do so. The book's binding then gets inserted into the LeapStart holder, much like an old school Trapper Keeper, but without the scary claws. A pen-shaped stylus is connected to the device and encourages fine motor skills and supports proper writing grip. With this pointer children then tap to discover more within the book and solve the questions being asked in the different activities. Kids can tap any page or image to activate audio responses and play tasks designed to keep them engaged and coming back for more. My Take: This is the perfect aged tool for my preschool boys right now as they start to trace, learn their numbers and practice letter recognition. I also like that while it incorporates technology, it's not another screen, but more like an interactive book. In fact, it needs a book to make it work. Unlike a delicate screen that I have to make sure they don't drop or break, the LeapStart is kid-tough. My twins have even stood on it and all was well, although of course I don't recommend doing that. The Twins Take: They like it, especially the activities that incorporate music and songs, which most do. Because it folds like a laptop, they call it their computer. The other day while I was working on my laptop, Logan went and got his LeapStart. I looked over to see him studiously tapping away alongside me as I typed. It was too cute. As a LeapFrog Mom Ambassador, I receive products, promotional items and educational material to use and share as I see fit. However, any opinions expressed by me are honest and reflect my actual experience. Links may be an affiliate. I love that they have such a large library so they can keep learning this would be perfect for our little one! Having 5 kids and being a single dad raising them, I have bought their products many, many times. They are great and the kids learn so much as they have fun. My nieces would have lots of fun learning with a Leapstart system. I love the LeapStart for my daughter too.. for 6the same reasons you mentioned! It seems to be tougher than a tablet and I love that she is learning while playing! I'd love this for my 4 and 7 year old! I think it'd be great to help my 4 year old with her letters this year as she's going into preschool. I like how Leap Frog is educational and fun. Love that its interactive, educational and fun! I love how educational this is and how it would keep my grandson's interest! This would be great for my grandson. Thanks for the giveaway. My kids would both love this! I am a big fan of LeapFrog products, very educational but fun. My niece would love this and it would be the perfect birthday gift! 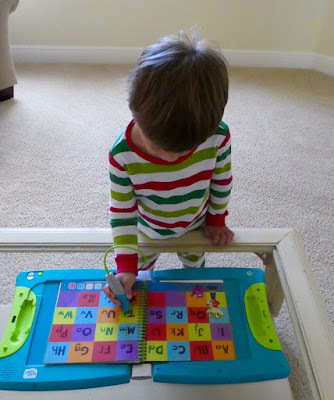 My boys would love to use this - learning while playing! My nieces love to learn with the LeapFrog learning system. If they had this they wouldn't want to put it down. I love that this covered multiple ages and learning grades/levels so both of my girls could play and learn at the same time. I would love this for my son who just started kindergarten. This looks like a lot of fun. I think my daughter would enjoy it. I love the Leapfrog products. I first used them with my daughter as a toddler(now 16)and it really prepared her for kindergarten. I would love to when this for my 3 year old son! This would be perfect for my niece. 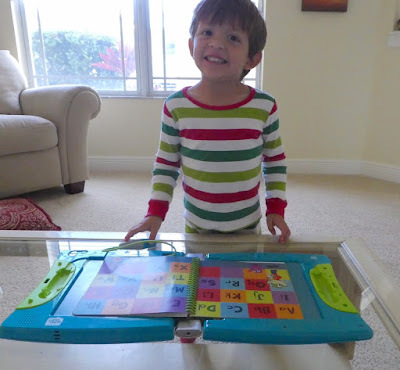 Leapfrog has a lot of great educational products! This would be so perfect for my son. I love how Leapfrog makes learning so much fun.